Going to start my lighting journal. Bought TYC headlights so I can hack those thinking they were butyl sealed...Permaseal... Hacked the first set. Then tried prying the second set with no heat and I was able to open them perfectly. Lesson learned.. Using Bi-LED projectors from aliexpress. Probably going to take a while, but stay tuned. Last edited by smart_alex; 03-02-2019 at 04:16 AM. which brackets did you use for the squadrons? did you have to do any trimming to make them fit? I got the Paranoid Fabrications bracket with the H11 harness. It was a tight fit but if you push back the fogs are far as you can the covers snap in. Some people have had to trim theirs though. Projector Alignment will be next weekend. So I haven't had the guts to rip open the headlights on a new car yet. So I will ask you, the chrome boomerang shape in our headlights (premium), does that piece of plastic separate from the rest of the unit? Are you adding an LED strip on the surface of the boomerang shape as well? Yes it all separates. The chrome C trim, pops out, the black bezel is held by three screws and two tabs, and the 3 reflector bowls are screwed to the housing. I had to drill small access holes for the high and low beam. 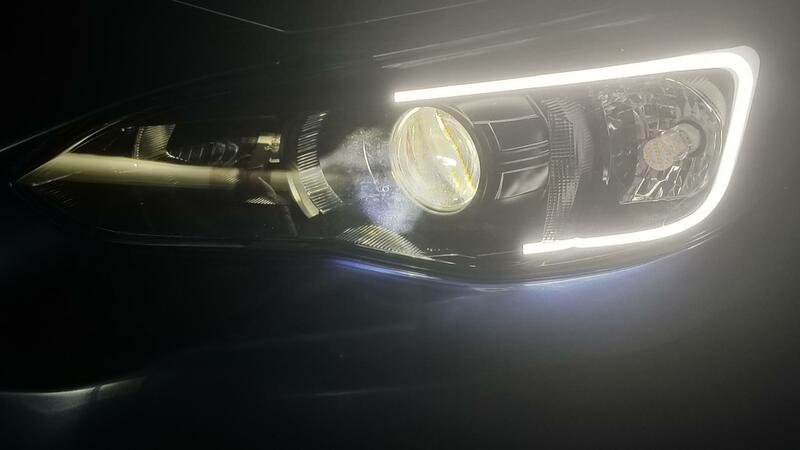 I used the Diode Dynamic C light for the 2015+ WRX. Sort of fits, you have to shift the C light a little lower so the wires have room in the corner. Painted the chrome C trim. It scratches too easily and blue painters tape will take the chrome off. My lights "should" be done this weekend. Already mounted the Bi-LED projector with JB weld. Did some more trimming to be able to level them properly. The shrouds are a pain and had to repaint 1 of them. Still trying to figure out the 9005 bulb DRL. Saw the hand brake method, wondering if I can temporarily ground the wire and wire the C light as a DRL with an Add a fuse. 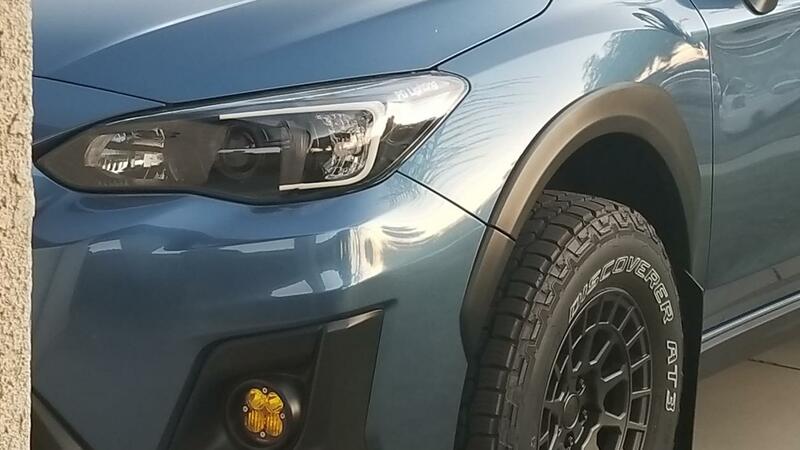 Would like to use both my 9005 high beam and bi-LED as high beam. Man this is awesome, cannot wait for for more updates! If all goes to plan you may have to do a DIY for some of us who are not as electronically skilled! I want to find a way to add a C light as well but you are definitely a lot further into the wiring process than myself. Well finally done. Wasted two weekends because I decided to paint before trimming the shroud. Anyways I'll post the output and night shots when I do a little photoshoot this weekend. No light bleed through the shroud since I used HVAC aluminum tape. Headlamp Low fuse >>>add a fuse>>> aftermarket fog light harness with relay>>>> + - to DD C light DRL wire. 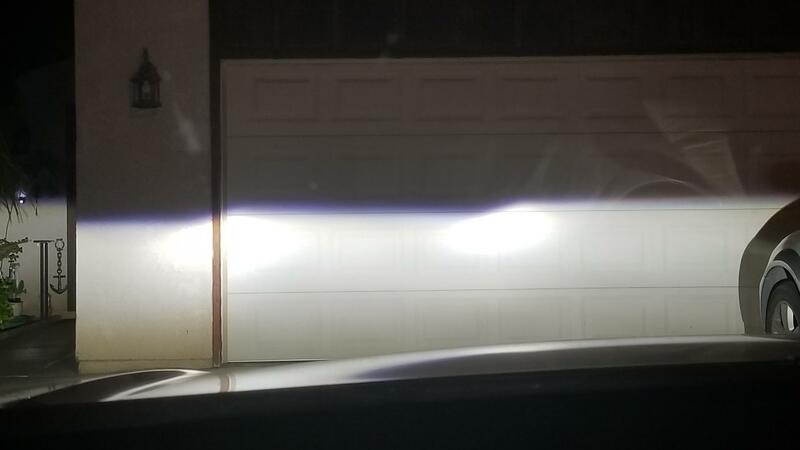 Powers the DD C Light in bright mode when Car is on. t10 side marker>>>t10 canbus/antiflicker (for safety)>>>DD C Light dim wire. This powers the C light when the car is off. May have to fix this. Turn signal bright wire>>>DD C light turn signal wire. used https://www.amazon.com/gp/product/B0...?ie=UTF8&psc=1 since they have built in "resistors" and are known on HIDPlanet as the Triton killers. Both that and the C Light blink amber and then C light switches back to White for DRL. Clipped the stock running wire on the TYC harness since I just want the DD DRL on. High Beam wire is tied to the Bi LED so that still works. Left the stock 9005 bulb unplugged as I could not figure out how to use the car 9005 harness as a DRL power. Thanks for looking! and sneak peak of my wheels and tires. I guess I'll make a build journal now. Thanks! it's actually not that hard if you ignore the stock 9005 harness as a DRL power source. I tapped into the Headlamp Low L/H fuse with an add a fuse and used that as a power source to the aftermarket fog light harness https://www.ebay.com/itm/GOOACC-12ft...72.m2749.l2649 like this. Clipped that fuse and tapped to the fuse box. connected the switch wires together since I wanted it "on" at all times it got power. Works great and has safety features. Cool, raised the passenger side a little and they're pretty even. Driveway has an incline. C Light stays on during the day without headlights on as the DRL. Those little glare spots are from the outback to the right.